Since it was FA Cup 5th round day, I waited to book my train to this game until we were knocked out of the cup. Needless to say, I’d completely ignored the fact that our opponents were still in the competition so was sweating during their 4th round replay. An added complication was that, at the time that I booked my tickets, there was signalling work planned for the West Coast line so I had booked a slow cross-country train which would get me in later than I would usually plan for. In the interim there had been a landslip that meant that my already long train journey was interrupted with a bus between Banbury and Leamington adding another hour with the consequence that there would be no time for a pre-match pint. Bulletins picked up on the way indicated that there were also problems on the roads so the away contingent could be severely depleted. The final leg of the journey was another rail replacement bus and, as we reached the stadium with less than half an hour to kick off, I could see that the official supporters’ coach was just parking. Relief all round. When we arrived outside the turnstiles, one of the stewards asked what we thought the score would be. “Depends which Watford turns up,” “Yes, we’re a bit like that too.” An interesting game in prospect. The main item of team news was that Troy had been dropped to the bench with Vydra taking his place. He was joined by Hoban and Tözsér who were replaced by Ekstrand and Abdi, both returning after spells on the sidelines. The starting line-up was Gomes, Angella, Ekstrand, Cathcart, Anya, Watson, Layun, Abdi, Paredes, Vydra and Ighalo. The first goal attempt of the game went to the home side as Clough played the ball back to Le Fondre in the box, he always scores against us, but this time his shot was high and wide. There was an early yellow card for Cathcart who was penalized for pulling Feeney back as he tried to escape down the wing. For the visitors, Abdi played the ball out to Anya whose cross was blocked, the ball found its way to Vydra whose shot went out for a goal kick. Janko broke into the box with Angella in close attendance ensuring that the ball ran through to Gomes. Anya broke forward and crossed, but there was no Watford player in the box to take advantage. We waited 18 minutes for Watford’s first goal attempt and then two came at once. Anya broke forward again, played the ball back to Vydra who found Abdi in the box whose shot was blocked by Lonergan. The clearance fell to Anya who played it back in, it finally reached Vydra on the edge of the box but his shot was gathered by the Bolton keeper. Watford put themselves in danger as a mix up between Angella and Gomes resulted in a corner and Gomes needing treatment. From Feeney’s set piece, Wheater had a free header that flew just wide. Then Vydra gave the ball away to Wheater who released Le Fondre, he found Janko who fired a shot wide of the target when he really should have done better. It was the visitors who took the lead on 25 minutes through who else but Ighalo. The Nigerian had received a pass from Watson, appeared to get the ball stuck under his feet but recovered to shoot and the ball seemed to enter the net in slow motion. The home side had a great chance to break back soon after as a Gomes punch fell to Le Fondre whose shot was blocked on the line by Watson. Bolton’s first yellow card went to Bannan who was booked for pulling Abdi back. Bolton should have equalized with a curling shot from Bannan that was tipped over the bar by Gomes. Watford threatened again as Vydra exchanged passes with Ighalo, the ball was played to Paredes who just passed it to the keeper. Bolton equalized in controversial circumstances. The lino was flagging for offside against Le Fondre so the Watford players and fans took little notice when Feeney crossed and Clough turned the ball into the net. I was baffled to see the home fans celebrating as they must have seen the flag. Then the realization hit that the lino had lowered his flag and the referee had signalled for the goal. There were heartfelt appeals from the Watford players and strong opinions being expressed by the fans, but the goal stood. This knocked the stuffing out of the Hornets and the home side took advantage. From a free kick, Ream shot into the side netting. Then Bolton took the lead as Feeney broke forward and crossed for Le Fondre (who always scores against us) to shoot past Gomes. We were all feeling pretty aggrieved at half time, but the players and the fans just needed to forget the injustice and get on with the game. Thankfully, the players started the second half on the front foot. 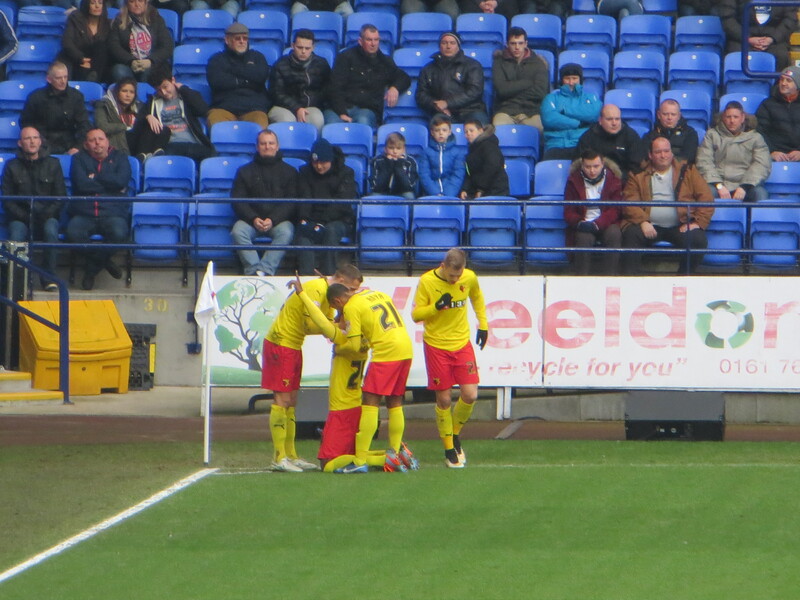 Abdi and Ighalo combined to find Vydra who was fouled on the edge of the box. Abdi’s free-kick was heading for the top corner until Lonergan got a hand to it to keep it out. 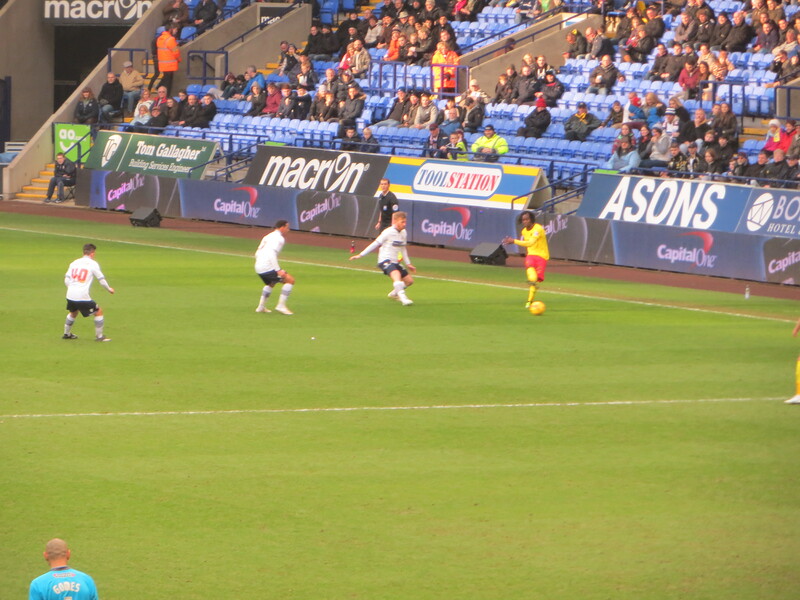 Vydra played the ball to Anya who juggled it to get some space before taking the shot which was saved. Abdi tried a shot from the edge of the area that flew wide. On 56 minutes, Jokanovic made an attacking substitution taking Angella off for Deeney. Troy’s first act was to play a ball to Paredes whose dangerous cross was headed clear. Soon after, Deeney got the ball in the box, he turned to shoot but the shot was blocked. There was danger for the visitors as Watson lost out to Clough who passed to Le Fondre who was one on one with Gomes who did very well to block the shot. Clough broke forward and again fed Le Fondre who looked sure to score but hit a dreadful chip over Gomes and wide. 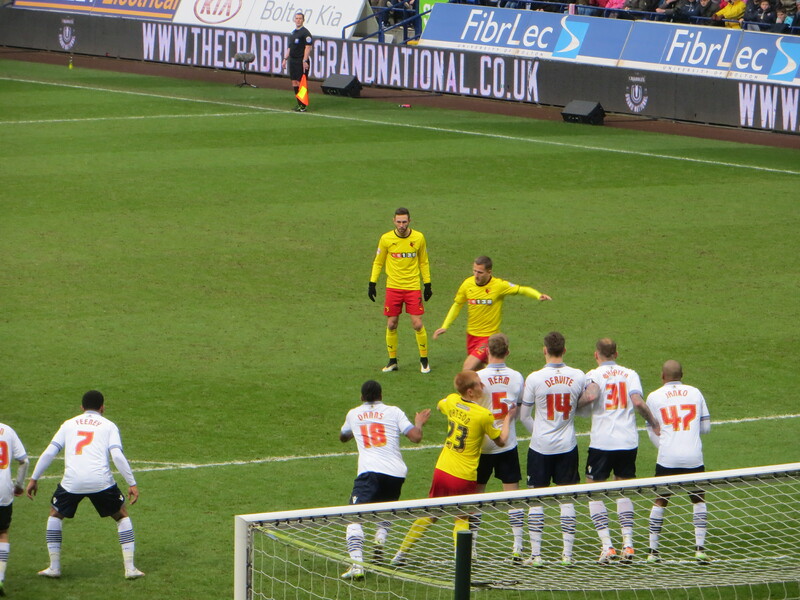 At the other end, there was a scramble in the Bolton box as first Deeney and then Watson had shots blocked. Then Deeney and Ighalo exchanged passes but the shot was deflected for a corner. Jokanovic made two more substitutions bringing Forestieri on for Vydra and Tözsér for Watson. Another decent shot from Abdi was stopped by Lonergan who also saved Ighalo’s follow-up, although the flag was up anyway. A ball reached the dangerous Feeney in the box but Gomes came out to gather. Watford’s equalizer was a thing of beauty as, just as he did at Fulham, Abdi curled a ball into the top corner in front of the Watford fans. Thankfully this time I was not behind a pillar so had a perfect view. It was no more than we (and Almen) deserved. Bolton tried to hit back immediately from the restart and it took heroics from Gomes to deny them as he parried a shot from distance by Feeney, blocked the follow-up from Le Fondre and somehow got across the goal to deny Clough. A remarkable effort. At the other end a corner was headed straight at Cathcart, the ball dropped to Deeney who tried to turn it in but the effort was blocked. Watford regained the lead in style as a cross from Abdi was met with a gorgeous header from Ekstrand. A wonderful way to mark his return from injury. Abdi tried another shot from distance, but Lonergan was equal to this one. Bolton’s first substitution saw Gudjohnsen come on for Janko. We were waiting for Neil Cox to join him. The home side drew level again on 84 minutes as Feeney, who had been a menace on the right all afternoon, crossed for Clough who fired past Gomes. Watford continued to attack as Anya advanced to the by-line and tried a cut back that was cleared. Abdi then tried a shot from distance that just cleared the crossbar. There was pandemonium in the away end as Ighalo played the ball across to Deeney who fired past Lonergan just as the clock hit 90 minutes. Obviously the celebrations were mighty and Ighalo was booked for his part. The fourth official’s board went up during the celebrations so I didn’t see it, but someone nearby reckoned there were 4 additional minutes. Bolton did have the ball in the net again through Wheater, but the flag had been raised before it reached him and thankfully on this occasion the lino kept the flag up. 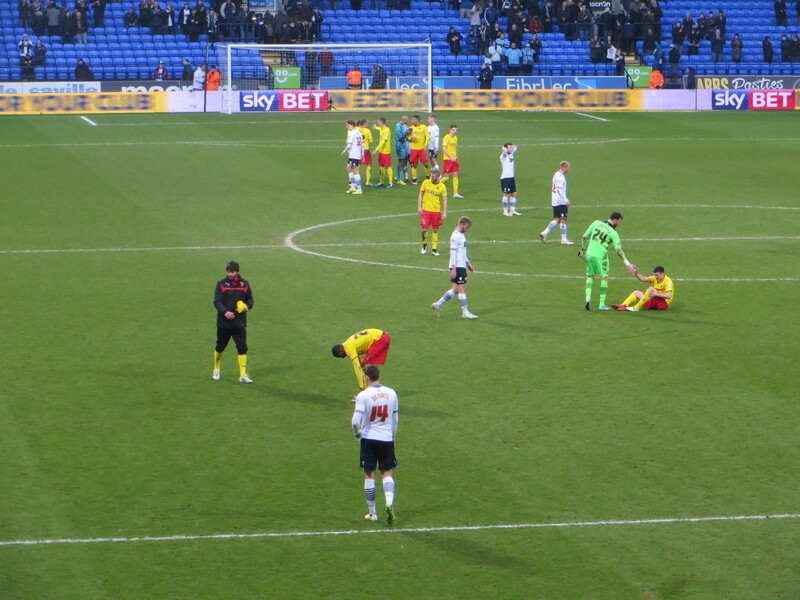 When the final whistle went, a couple of the Watford players dropped to the ground as did a number of the Bolton players. They all looked dead on their feet and certainly those of us in the stands were completely drained. What a terrific game of football. There were ecstatic grins in the away end and hugs between friends and, most likely, complete strangers. The players came over and were greeted as the heroes that they were. Ighalo, Layun, Forestieri and Deeney thanked us by nipping over the advertising hoardings to give their shirts to the crowd. I have always found the people of Bolton to be lovely and this was shown again as an official walking around the pitch while we retrieved Becky’s flag commented to us that it had been a good match. We also saw our friendly steward on the way out and he was equally gracious. Just before 10pm I boarded a rail replacement bus at Leamington Spa with the prospect of three further trains before I was home. Soon after, a father and son got on and I was greeted with a “You Orns”. That perked me up and we were soon waxing lyrical about the terrific game we had seen. I finally arrived home over 16 hours after I had left. It had been a very long day but one that I will remember for a very long time. As the match was coming to an end, the thought had gripped me that this must be a terrific game for the neutral and I felt a twinge of regret that I couldn’t see it through their eyes. In the cold light of day I realise what a ridiculous thought that was. No neutral would experience the joy and despair that I did yesterday. The rollercoaster that ranged from anger at the injustice to the sheer lunacy of the goal celebrations that had me leaping up and down punching the air long after the ball had hit the net. A few weeks ago, I had a conversation with a friend about the season so far and the fact that, despite being in the play-off places, it had not been an enjoyable season. That has been completely turned on its head since. The character and the passion on show in the past few games have made this team one to love. We even saw some emotion from our usually impassive manager at the final whistle. I can’t wait for next week. This entry was posted in Watford FC and tagged Adam Le Fondre, Almen Abdi, Andy Lonergan, Barry Bannan, Ben Watson, Bolton Wanderers FC, Craig Cathcart, Daniel Tozser, David Wheater, Dorian Dervite, Eidur Gudjohnsen, Fernando Forestieri, Gabriele Angella, Heurelho Gomes, Ikechi Anya, Joel Ekstrand, Josh Vela, Juan Carlos Paredes, Liam Feeney, Matej Vydra, Miguel Layun, Neil Danns, Odion Ighalo, Saidy Janko, Tim Ream, Tom Eaves, Troy Deeney, Watford FC, Zach Clough on February 15, 2015 by franelynn. Glad you enjoyed the day and all its twists and turns and thanks for your report to brighten another snowy day with the wind howling here in the new world–COYH!